Ask any Liverpool fan and they would say that Dutch striker Dirk Kuyt was the perfect embodiment of the team and the city as well. In simple terms Kuyt was the Dutch demi-god who gave Liverpool some of its best moments. Also referred to as the Dutch dynamo by many, Kuyt had six long and successful years at the club. Kuyt is also regarded by many as one of the five best Dutch talents the country has produced in the past 15 years – alongside Arjen Robben, Robin van Persie, Wesley Sneijder and Rafael van der Vaart. Kuyt will always be fondly remembered by fans of English football as the man who was not quite a striker and not quite a winger yet was indispensable for Liverpool. Kuyt also runs a famous charity in Netherlands alongside his wife which focuses on helping disadvantaged children in his homeland and developing countries. The Dirk Kuyt Foundation just recently celebrated its 10th anniversary. 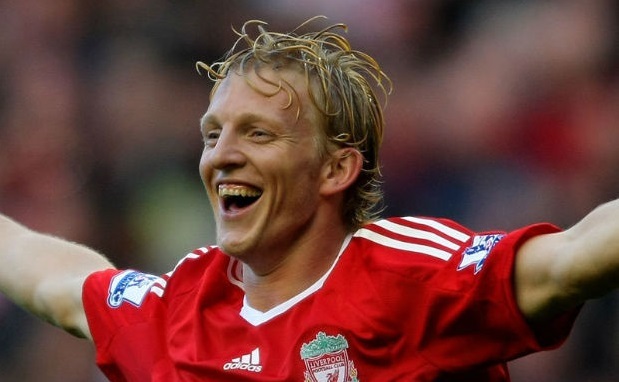 Dirk Kuyt was born in 1980 in a small town called Katwijk aan Zee in Netherlands. His father was a fisherman and most of Kuyt’s early years were spent with him thinking he would most likely follow in his father’s footsteps. However that all changed soon and by the age of five Kuyt was already part of a local amateur soccer team for boys called Quick Boys. By the time he was 18 Kuyt joined Hoofdklasse and played with them for six seasons. It was here where he caught the eye of another club Utrecht. He joined Utrecht in 1998 and quickly became part of its first team. He spent five years at the club, and in his final season he helped his team to the KNVB Cup. This historic win was followed by the Dutchman joining Feyenoord where he quickly became a fan favorite and continued to score goals left right and centre. He finished his debut season as the league’s Top Goal scorer with 29 goals – which was a career high for him. Kuyt eventually joined Liverpool in 2006 and thus began his legendary tenure at the club. He soon became a critics and fan favorite for the red jerseys due to his knack for scoring goals. Kuyt would often be the only goal scorer for many of Liverpool’s crucial matches including one again Aston Villa. In the six years at Liverpool the Dutchman scored in European and Carling Cup finals, scored hat-tricks and braces against the biggest rivals. Apart from the goals Kuyt also scored countless crucial penalties. Kuyt was part of his national team during the 2006 and 2010 FIFA World Cups. He was also part of the Dutch team during the Euro 2008 and 2012 championships. Kuyt played a huge rule in whipping Netherlands to the runner up position during the 2010 FIFA World Cup. Kuyt was voted as the Dutch Footballer of the Year twice – in 2005 and 2006. He has won the Dutch Golden Shoe twice in 2003 and 2006. He was also Eredivisie’s Top Scorer in 2005.